A spacious 3 bedroom penthouse apartment in the middle of Chelsea with rooftop views and private access. Modern and bespoke design throughout. A charming three bedroom, three bathroom penthouse with rooftop views across London. The private, direct access lift opens into a bright and spacious entrance hall leading to a large open plan reception and dining area with built in media unit, perfect for entertaining on a large scale or for family movie nights. A large and bright kitchen with breakfast table is fully equipped for all your culinary needs and boasts a 5 ring gas hob, double oven and plenty of cupboard space. The large master bedroom suite consists of 2 dressing room areas, both with ample storage, as well as a luxurious en-suite bathroom. The second bedroom can be made into your choice of either 2 single beds or one Superking size bed and benefits from good wardrobe space and an en-suite shower room. The third bedroom has a built-in desk and can be used as a private study if so desired. This apartment benefits from a third cloakroom/shower and separate utility room with washer and dryer provided. The terrace, which runs along the side of the building and can be accessed from all three bedrooms giving you uninterrupted views over London, from the spire of Westminster Cathedral in Victoria round to the famous Battersea Power Station towers. Bespoke design and modern details, including Sonos surround sound throughout, make this apartment perfect for London living. Other benefits include newly installed double glazed windows and a Banham intruder alarm system so you are always secure. This building (with live-in caretaker) is a quiet residential block perfectly located with Sloane Square tube only a moment away and the busy station of Victoria with-in walking distance. Private access parking is available on request. Please call our office if you have any further queries. A modern refurbished 2 bedroom/2 bathroom flat on the third floor of an exclusive block in leafy Ennismore Gardens with a 24-hour porterage team. Bespoke furniture and tasteful design make this luxury apartment ready to be a beautiful home. Both bedrooms equipped with the latest Smart TVs. 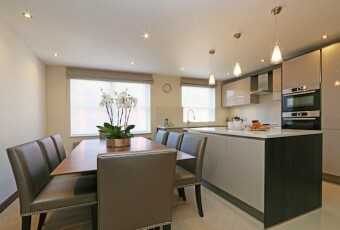 This flat is ready and fully equipped to be a comfortable and beautiful home. A modern refurbishment has created a space well suited for a family, a couple or one very lucky single. 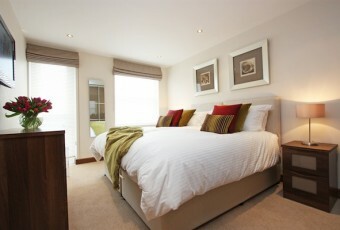 There are two super double bedrooms with the master benefiting from a generous en-suite shower. There is also a family bathroom and a separate guest cloakroom. The kitchen combines cutting edge design with practicality and is fully stocked with crockery, cutlery, utensils and appliances – everything you would need to make you feel at home. The dining area and kitchen are open plan and lead onto the reception room, but you can always close the American Walnut sliding doors if you wish to make the main reception room more secluded. This room is fitted with a state of the art smart 3D TV media centre and boasts bespoke furniture including an ample sized L-shaped sofa large enough for you, your family and any guests. Full height glass windows/patio door lead to the balcony which has been furnished so that you can sit out and enjoy the good weather. Residents have private access to the idyllic 2-acre landscaped communal garden which affords you the tranquillity of a garden in central London with the luxury of not being edged by a noisy road. This exclusive block has a 24-hour porterage, dual lifts and the heating and hot water are included in your rental. We’ve also taken care of your TV licence. This building falls under the remit of Westminster Council so residents’ parking is easy to organise. Please contact us for viewings – we are very proud of this flat and would be delighted to show you around. A modern 2 bedroom/2 bathroom flat on the 9th floor of this prestigious block in Knightsbridge, close to Hyde Park. Bespoke furniture, 24-hour porterage, dual lifts and communal gardens. A bright and spacious two bedroom flat on the 9th floor of this prestigious block in Knightsbridge, close to Hyde Park. The property comprises two double bedrooms (one ensuite), bathroom and separate cloakroom, fantastic storage is provided in both bedrooms. A fully stocked, open-plan kitchen/dining area connects to the main reception room and balcony by large American Walnut sliding doors. These can be shut to create two separate areas, or pull back for one large entertaining space. This building has 24-hour porterage, dual lifts and communal gardens. Heating, hot water and TV licence are also included in the rental. 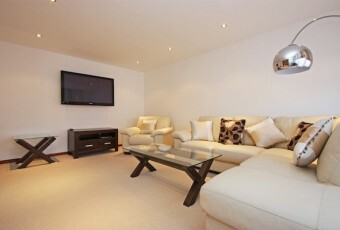 A lovely 2 bedroom/2 bathroom flat in a prestigious Knightsbridge block near Hyde Park. 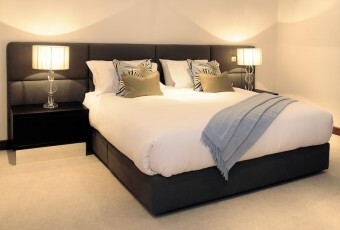 Fully furnished, 24-hour porterage, dual lifts & tranquil communal garden. A 2 bedroom/2 bathroom (one en-suite) Knightsbridge flat close to Hyde Park available to rent in a consistently popular block in Ennismore gardens. This prestigious building has a 24-hour porterage team, two lifts, private key access to the communal garden and heating/hot water/TV licence is included in the rental. The flat consists of two well sized bedrooms with excellent storage, one ensuite, a family bathroom and a separate cloakroom. The dining room leads through to a reception room with balcony. © 2019 Peerman Premier. All Rights Reserved.